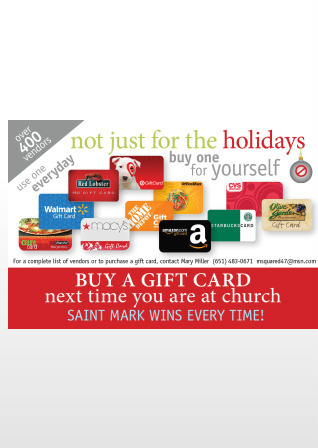 Purchase a gift card from 400 national retailers and a percentage goes to St. Mark. Order and purchase ( through St. Mark) a gift card for your favorite retailers to use for personal shopping or as gift purchases and a percent of the sale goes to St. Mark Lutheran. The best part is, it doesn't cost you or St. Mark anything! Please see Mary Miller to place your order of gift cards. Gift cards will be ordered bi-weekly.